Before you can try out NAV-X Credit Card, you need a test merchant account. If you have one already, you can skip ahead and either use the Assisted Setup to configure NAV-X Credit Card with the test credentials or follow the steps below to update the Credit Card Setup with this information. If you want to try out NAV-X Credit Card with our free trial, you can request test merchant credentials here. If you have not yet signed up for a Microsoft Dynamics 365 Business Central, you can sign up for a free trial at https://trials.dynamics.com/Dynamics365/Signup/businesscentral. Once you have your solution provisioned, you can add the NAV-X Credit Card app directly from the AppSource marketplace here. 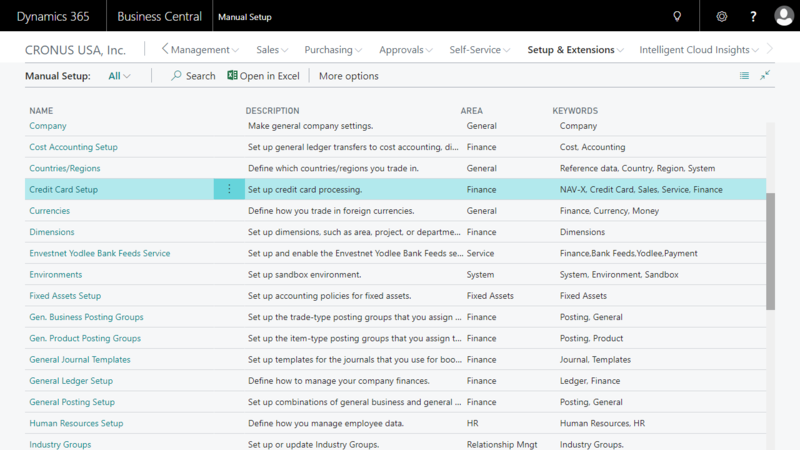 If you have questions about the installation process of an app through Microsoft AppSource, you can review the Microsoft Dynamics 365 Business Central documentation here. Once the app is installed and you start the Assisted Setup, you will be asked to enter your email address. This email address is used to send you test merchant credentials as well as contacting you about an application for a live merchant. If you already requested test credentials, you do not have to fill in this email address. Please note that we have to generate keys for you for testing, this can take a day or two, but we will get back to you as soon as possible in the order of received requests. 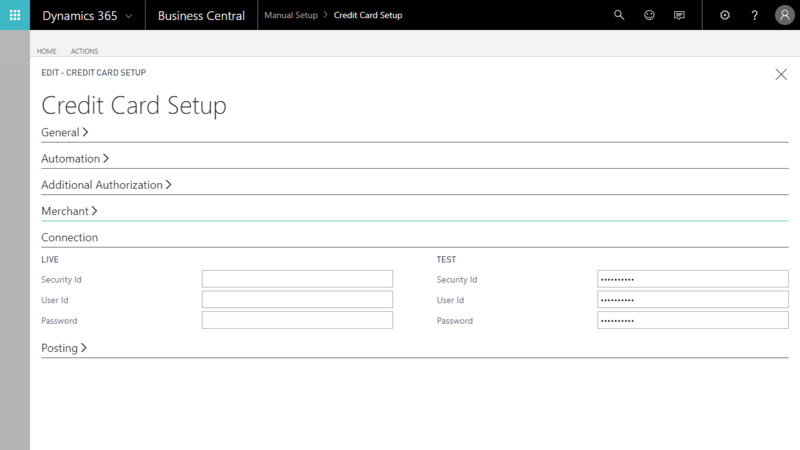 You can start the NAV-X Credit Card Setup from the “Manual Setup” page. If you type “Manual Setup” in the search box or select “Setup & Extensions” -> “Manual Setup”, you will see the following page. Please select “Credit Card Setup” from the options. The Credit Card Setup has a fast tab called “Connection”. This fast tab contains fields with the “Security Id”, “User Id”, and the “Password” for the live and test merchant accounts. In this case, after you received the test merchant credentials, please copy and paste the credentials into the fields “Security Id”, “User Id”, and “Password” for the “TEST” account. Please validate that the field “Processing Mode” in the fast tab “Merchant” on the Credit Card Setup page is set to “Test”. Only then can you try out the functionality without requiring a live merchant account. When the mode is set to “Test”, you will only be able to use test credit cards to ensure that you don’t charge real credit cards by mistake. You can find a list of test credit card numbers to use here.